Step into my secret garden and get lost amid the flowers and foliage. 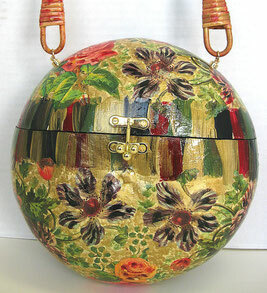 Decoupage and handpainted Roses and other florals give this bag a true vintage look. Rich gold paints meander through the garden and deep green foilage. Step into our fantasy and travel through the world of song with music notes, butterflies, birds, and Paris...just escape. This bags brilliant colors will allow you to carry it with almost any outfit. 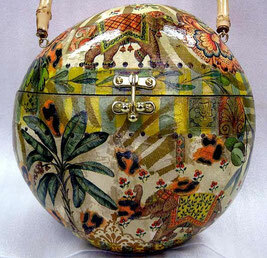 This combination of decoupage and artwork is special. 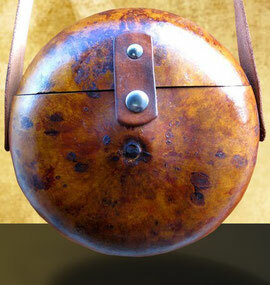 Since each one is a work of art this photo is representative of the bag you will receive. 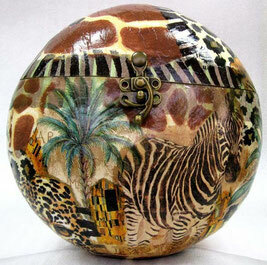 Our artistic vision on this decoupage and hand painted handbag is to take you on a wild jungle Safari...an adventure. The zebra's, pantha's and assorted animals roam throughout the lush greenery and the Sahara desert. We placed the animals against a brown and creme bacground on the front and back. 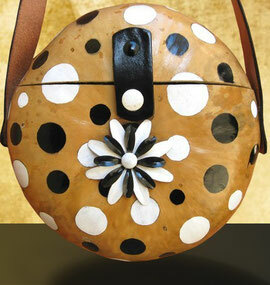 This gourd handbag is a departure from how we usually decorate our bags. We drew random sizes of dots on our gourd and hand painted them. We think polka dots are cool. Pink and white dots accented with a brass painted pink and white 3-dimensional flower. 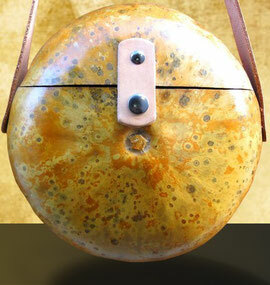 Connect the dots as you collect admiring glances when you carry this bag. 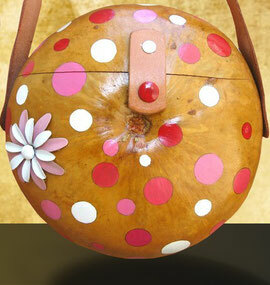 This Gourd handbag is a departure from how we usually decorate our bags. We drew random sizes of dots on our gourds and hand painted them black and white. We think polka dots are cool. The same 3-dimensional brass flower painted black and white. Connect the dots as you collect admiring glances when you carry this bag. 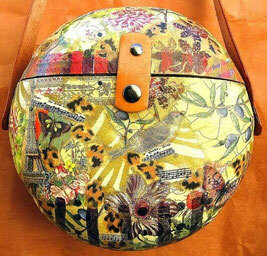 The art on these gourd handbags was designed by nature. We carefully handpick gourds that have random variegated patterns, then enhance that pattern with a non-toxic wood oil to enhance the natural beauty of the patterns.